Around 500,000 people attended the parade in Dublin, the country’s largest parade. AROUND HALF A million people lined the streets of Dublin this afternoon to catch a glimpse of the country’s largest St Patrick’s Day parade. Hundreds of thousands of parade-goers turned out for annual events across the country today, when crowds were wowed by musical performances, floats, street-theatre, and pageantry. 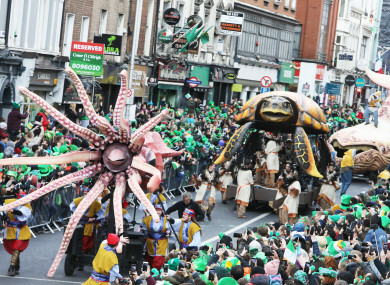 In Dublin, more than 3,000 people took part in the capital’s parade, whose theme celebrated Irish storytelling. Organisers estimated that more than 100,000 overseas visitors joined the home crowd, enjoying around two hours of performances which brought to life various tales and narratives of Ireland and the Irish. Deirdre O’Kane and Jason Byrne were this year’s Grand Marshals, and highlights included an appearance by President Michael D Higgins and a flyover by the Irish Air Corps, their first time taking part in annual parade. The parade was a particular highlight for Lord Mayor Nial Ring, who said it was an honour to be able to partake in the event. “From sitting on my Dad’s shoulders to standing on a ladder to watch the parade I have many fond memories of it,” he said. Meanwhile, Olympian Rob Heffernan led events in Cork city, which kicked off at around 1pm. Organisers estimated that around 50,000 people attended to see more than 3,000 community groups take part to showcase the theme of the stories of Cork. Around 32,000 people also attended a parade along O’Connell Street in Limerick, where the theme celebrated 50 years since the moon landing. Grand marshal Dr Norah Patten led a parade with dozens of participants and floats, which also paid tribute to the city. Speaking at the annual St Patrick’s Day reception at Áras an Uachtaráin this evening, President Michael D Higgins said the day was a time when the global Irish family could “join together to celebrate our Irish culture and heritage”. “On this St Patrick’s Day, when we celebrate the life of St Patrick… we also celebrate and offer to the world those aspects of our values that make us uniquely Irish,” he said. Email “Pictured: Hundreds of thousands take to streets of Ireland for St Patrick's Day parades”. Feedback on “Pictured: Hundreds of thousands take to streets of Ireland for St Patrick's Day parades”.